Cook and drain tortellini as directed on package. Meanwhile, in 12-inch skillet, heat oil over medium heat. Add onion; cook 4 to 5 minutes, stirring frequently, until lightly browned. 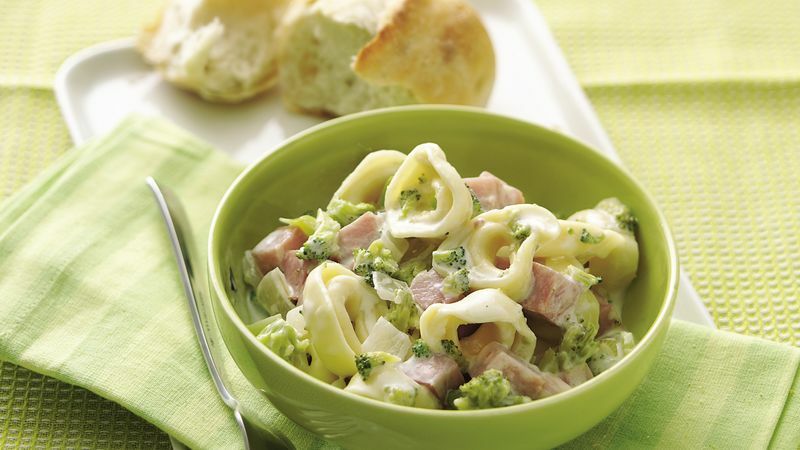 Stir in ham and broccoli. Cook 5 minutes, stirring occasionally. Stir in cream and cheese. Heat just to boiling over high heat. Stir in tortellini. Reduce heat to medium; simmer uncovered 4 to 5 minutes or until thoroughly heated. You could substitute cubed cooked turkey or chicken for the ham. Serve with crusty French or Italian bread, with extra-virgin olive oil on the side for Italian-style dipping.